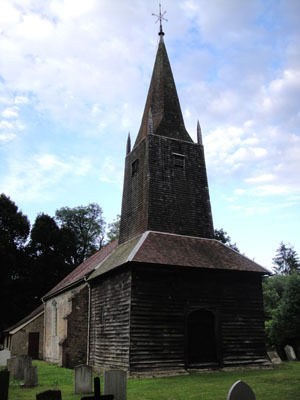 The bell tower at Burstow is one of only two in Surrey to have been constructed from wood (taken from nearby Worth Forest). It houses six bells: the treble is the newest, having been added in 1906, while the heaviest is the tenor which weighs 12.75 cwt. On the bells, inscriptions can be seen which provide some information on the history of the bells including who cast the bells. The bells are rung from a ground floor ringing chamber at the rear of the church. In drier conditions the timber in the tower shrinks causing the movement of the bells when rung to lead to actual swaying of the spire. Movement can be felt throughout the tower walls… Don’t worry, safety checks have been made, but it is certainly something to witness! Ringing takes place for weddings throughout the year, as well as for special occasions such as Christmas and Easter. We also try to ring on the second Sunday of every month before the service and practice takes place on the first and third Wednesday from 7:30-8:30. Due to variable numbers, it is advisable to contact the Tower Captain before attending practices to check that the practice will be going ahead that evening.